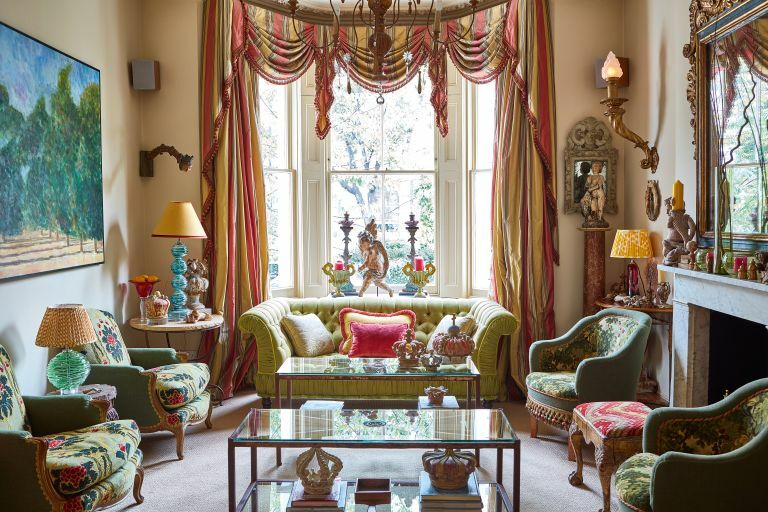 Daphne and Gordon Dunn’s 1840s west London home is an emporium of antiques and curiosities. Period elegance unfolds on all four floors, heightened at Christmas and New Year when sparkling fairy lights, and sprigs of eucalyptus and fresh greenery turn the Victorian townhouse into the quintessential festive home. The setting is a world away from Daphne and Gordon’s American roots, yet is exactly where Daphne dreamed she might live one day. ‘I’ve yearned to live in England since I was seven as I loved all the classic English stories like The Secret Garden and A Little Princess,’ she explains. ‘Then I came to London as a student, and being where my favourite writers had lived was magical.’ Daphne and Gordon made the move to London in the 1990s and bought this house in 1999. They immediately extended the basement kitchen, and turned a tiny bathroom and spare bedroom on the first floor into a master bedroom en suite and dressing room. They also added reproduction Victorian cornicing – using original moulds – to the living room and bedrooms, and tongue and groove panelling up the stairs and along the hallways. Daphne scours antiques fairs here and abroad for quirky and unusual pieces. A pair of 19th-century church shutters are now cupboard doors, expertly replicated in MDF for the cupboard opposite, by artisan decorator Chris McClure. He also copied the carved wood panelling in the dining room after Daphne closed the room off from the kitchen. The dining room is Daphne’s most indulgent room. She reinstated the dividing wall between here and the kitchen, then papered it with Ananbo Chestnut wallpaper to create a trompe l’oeil effect. The French reproduction Louis XIV table and cane chairs were made in the 1920s and came from the USA. Daphne made the slip covers from a fabric embroidered with regal emblems, which she bought from 1stdibs. A pair of ornate antique carved panels from M Charpentier Antiques have been repurposed as doors for the cupboards in the dining room. The simpler doors were made by Linden-Bauer in MDF, with an aged finish by artisan decorator Chris McClure that echoes the antique panels. Back on the ground floor, in the double-ended living room that spans the length of the house, Daphne has used a combination of yellow, green and faded pink tones contrasted with jewelled gold and fuchsia to capture the glamour and ambience of Venice. ‘This is Venice by day and Venice by night,’ she explains. Venetian elegance is evoked with blown glass lamps, angels poised among Baroque sculptures, and Italian Colony and Fortuny fabrics for upholstery and cushions. It has taken Daphne years to get her home to a point of satisfaction, and it’s a quest that never ceases. She holidays in Europe around antiques fairs and seeks out at least one antique shop wherever she goes. Daphne found the oil paintings in a charity shop and had them restored. She since discovered they are by an artist that has sold at Christie’s. The red fabrics complement the Farrow & Ball shades chosen for the walls – Mizzle – and woodwork – Pigeon.